Juggling John provides juggling balls as circus themed going home presents. If Juggling John is providing these for you he can show the children how to use them during his show or workshop. If you order them, Juggling John will bring them with him on the day of the party on a sale-or-return basis, so you only need to provide rough numbers and you will only pay for what you need on the day. 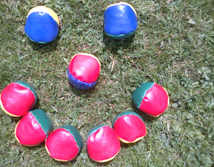 A set of 3 brightly coloured juggling beanbag balls with instructions.